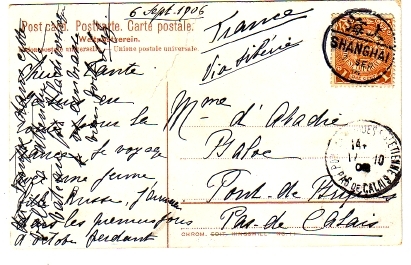 Postcard Particulars: The flag on top left is Kingshillâ€™s mark. 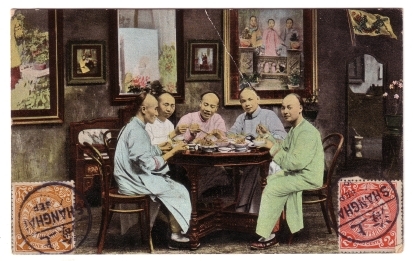 Action: Five men seated at an hexagonal table eat a meal. Decor includes Western chairs, portraits on the wall, mirrors and other paraphernalia, as well as a carpet. Image Particulars: All the details of decor are typical of the inside of a photographic studio, although they are rarely seen so clearly as such scenes were usually shot in bland surroundings.. The Western chairs were liked by Chinese as showing Shanghai sophistication. The women portrayed on the wall will be famous local courtesans.